The act of pilgrimage takes a number of turns across a lifetime. Sometimes you embark with the destination in mind, as medieval pilgrims did to Jerusalem or Rome or Canterbury, and sometimes you find out (as I imagine some of those medieval pilgrims did) that the meaning of the journey lay in the process, in what you encountered along the way. We have all heard versions of that simple (and simplistic) “either/or”; it’s not much more profound to say that every pilgrimage is a combination of both the planned and the accidental, the destination and the getting-there. What interests me today, though, is a different take on pilgrimage—one that arises from both these categories and yet veers away from being comfortably either or both. Sometimes you are on a pilgrimage, and you don’t notice until you get there. It’s been eight years since Rhonda and I made the journey to New Zealand, along with several colleagues and a handful of remarkable students from the University of Louisville’s Honors Program. 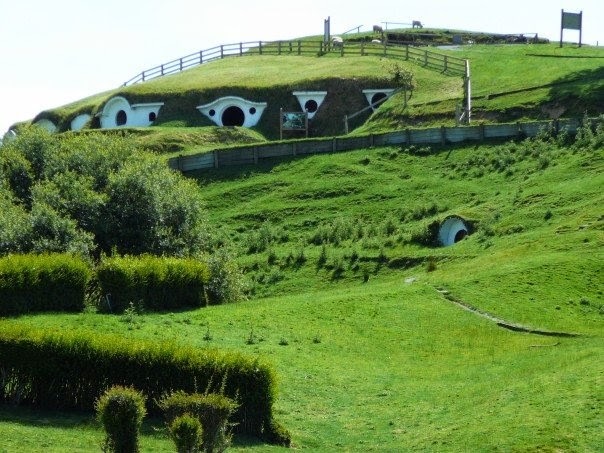 It was a journey to be envied, if you asked a number of my writer friends: a Tolkien seminar that included The Lord of the Rings, then Peter Jackson’s movie treatment of the great novels, would be followed by two weeks among the film sites in New Zealand. We carefully selected these students, guided (at least in my case) by their love of the books. We passed over worthy candidates in a search for those whose application essays showed a respect, a curiosity, and an affection for Tolkien’s work, so in some cases the almighty GPA was less a factor (though these were Honors students with excellent grades) than a passion for the subject. It was a good standard to apply. We chose excellent company—bright and creative, irreverent and intellectually engaged. I don’t remember what the grades were (A’s and B’s, no doubt), but I remember the people and their work with fondness, as the class evolved into a mutual labor of love. The trip was, as you might imagine, a kind of crown to the experience. Yes, they were supposed to work in New Zealand, but I kept assignments feather-light, the idea being to leave them to their resources, to let them become a Fellowship. All disciplinary matters were in the capable hands of my colleagues, John Richardson and Luke Buckman, and to this day I have no idea whether any student was upbraided or even corrected. The travel experience was not uniform. There was pleasant and funny testament to this (one young woman boarded an airplane for the first time, and her exuberant whoop when it lifted off the ground kept me smiling from Louisville to Chicago on the first short leg of the journey), and there were circumstances more perilous and accidental: my passport was “inquired into,” as my name is not the most uncommon in the world, and one young man implied, loudly and teasingly and in the middle of LAX airport, that the inquiry had to do with “alleged connections to the IRA”. Those connections were so deeply alleged that he had made them up on the spot, but the post 9/11 discomfort in an international airport was, believe me, very real. Despite my close brush with cavity search, the rest of the trip to our destination went according to plan. And here we return to the subject at hand, because it was on a hilly little farm near Matamata on New Zealand’s North Island that it became clear to me how I had been a pilgrim all along. Some of you may know this story, but when I was fourteen, a baseball injury placed me on my back, more or less, for an entire summer. It turned out that the problem rose from my having a mild and undetected spina bifida, apparently more common in our region than was known at that time, mostly (oddly enough) in males of Welsh descent. While I was laid up, my cousins Tom and Gary (two other males of Welsh descent) introduced me to the trilogy in the hopes that a long book could tide me over in a long, inactive summer. It did just that. And in addition, it redefined me, as epiphanies are supposed to do. The revelation came for me, as I will tell in the next entry, in the third chapter of The Fellowship of the Ring. For now, it is better to consider where it led me. For after having read the trilogy, I knew that my story would center on stories, on reading them and telling them. I would discover in the years to come that stories were my principal way of understanding the world, of vesting it with meanings both evident and veiled, both communal and deeply private. Myths were stories, after all, and through telling tales we brush the edge of myth, even now in a world where the most simplistic among us pride themselves in being myth-free. It was a lesson I took with me, through college and graduate school, to my stay in publishing and on into writing, through my conflicts with fellow academics who considered the trilogy a “children’s book” without having read the trilogy (or, I would guess, much children’s literature), and who considered me (verbatim) “not a real writer” for embracing Tolkien, heroic fantasy, speculative fiction in all its shapes and forms. Things have changed with the academicians, and with me as well, because it took me a while to realize that my journey and its branching, resultant conflicts were all pilgrimage as well. On the Matamata farm it hit me. This was a place Jackson had negotiated with a sheep farmer, who refused to speak to the eminent director until a contested televised rugby game was complete. This was the place that housed the movie’s version of Bilbo’s Party Oak and the opening scenes set in the Shire. Green slopes tumbled down to a fence row and a small, weedy pond not much bigger than the one in my grandfather’s east field, visible from the house in which I had read much of Two Towers. The smell rose in the warm December air, fragrant and fresh, though there were sheep turds underfoot you’d have to watch for. 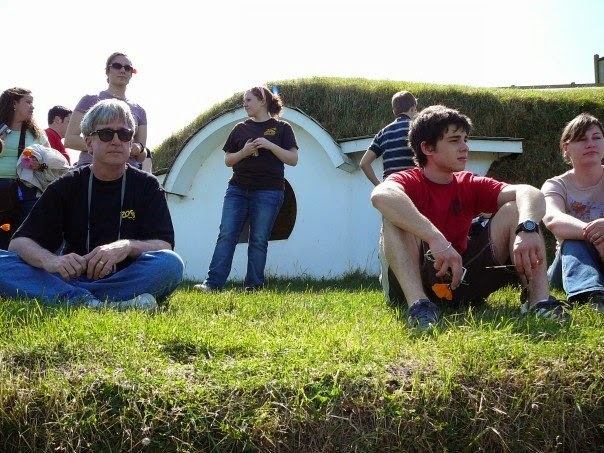 One of the students sat on the slope above what had once been Bag End, which was now a white oval framework bedded in the bright green of the hill, and he leaned on his knees, quiet and teary, on the edge of being overwhelmed by his emotions, fixed to this spot he was no doubt coloring and peopling in his memory and imagination. I sat down by him, put my arm around his shoulders. Cautioned him that, if he started to cry, I would, too. We looked off to the west, at the tree and the pond, each imagining a different Shire that was our mutual destination and home. One of the young women produced a recorder and began to play the soft, solitary theme song of Jackson’s trilogy, and it never sounded so good and so lonely and so transformingly communal.